Patrick Comerford: Would the real Sherlock Holmes please tell me his real address? please tell me his real address? No 221B Baker Street is said to be the ‘most famous address in the world.’ It is elementary, my dear Watson, for it is here, according to Sir Arthur Conan Doyle (1859-1930), that the detective Sherlock Holmes and his friend and colleague, Dr Watson, lived between 1881 and 1904 in a boarding house run by Mrs Hudson. The character of Sherlock Holmes was created by Sir Arthur Conan Doyle in 1887, and since then he has featured in more films than any other character in literature, and he has caught the attention of readers and audiences all over the world. With four novels, 46 short stories, and 75 different actors playing the character of Holmes in more than 200 films, many fans want to see where Holmes and Watson lived. 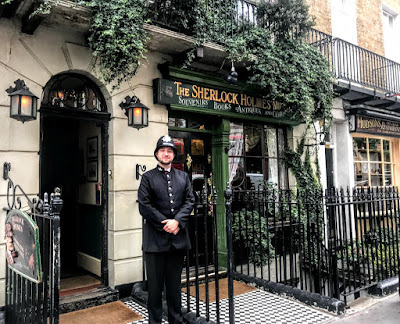 But, while it may be the most famous address in the world, it takes a little detective work for any sleuth to find the real 221B Baker Street. 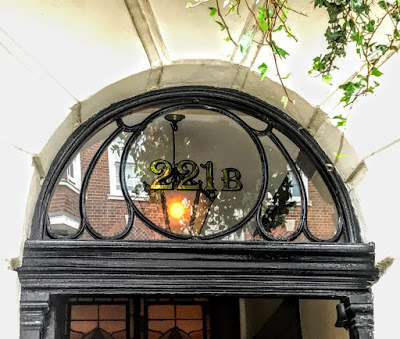 Sir Arthur Conan Doyle once had his medical practice at No 2 Devonshire Place, off Marylebone Street and close to Methodist Church House, where I was taking part in a meeting of the trustees of the Anglican mission agency USPG (United Society Partners in the Gospel) on Wednesday [19 September 2018]. It was just a 10-minute walk from Devonshire Place to Baker Street, which explains why Doyle was familiar with the streets in the area. But where exactly is 221B Baker Street? When Doyle was writing, Baker Street was made up of a number of Georgian townhouses, but these did not run as far as No 221, and the number only became possible when Baker Street was extended north. 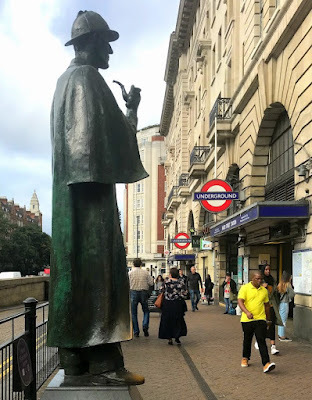 Walking in and out of Baker Street Station this week, it was difficult not to notice the larger-than-life statue of Sherlock Holmes outside the station, complete with his deerstalker hat, Inverness cape and pipe. But this statue is at the Marylebone Street entrance of the station and not on Baker Street. I had to walk around the corner into Baker Street if I was going to find where Holmes and Watson are supposed to have lived. Walking up Baker Street, I found what should have been the site of No 221B, but for many years it was just part of the headquarters of the Abbey National, then numbered 215−229 Baker Street. It was designed by the Scottish architect John James Joass (1868-1952). 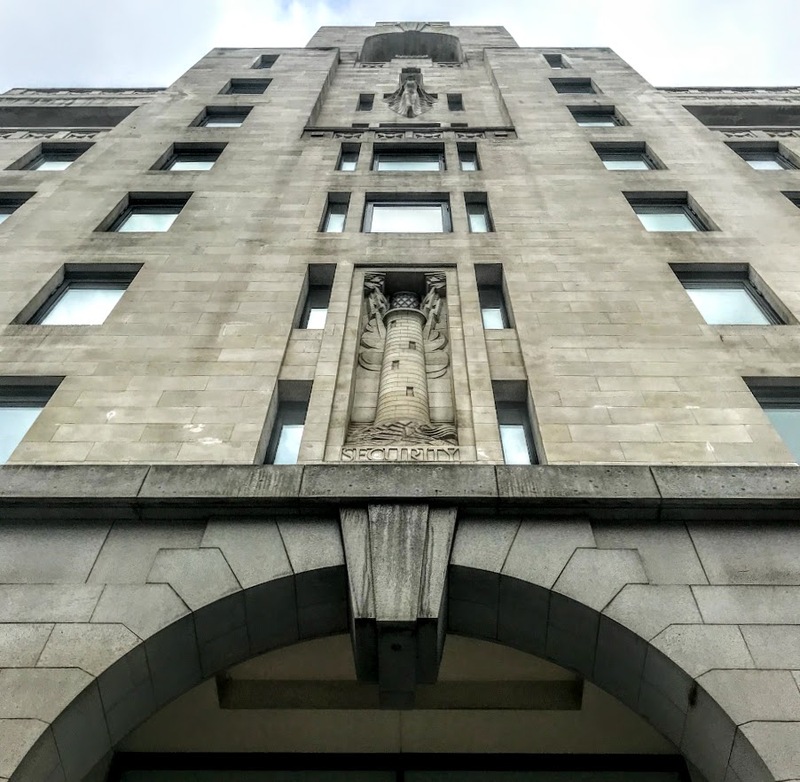 When street numbers were reallocated in the 1930s, the block of odd numbers from 215 to 229 was assigned to the Art Deco building known as Abbey House, built in 1932 for the Abbey Road Building Society. Since the 1930s, the Royal Mail had delivered all letters addressed to Sherlock Holmes to the Abbey National at this building, and the bank employed a special staff member to deal with this correspondence. 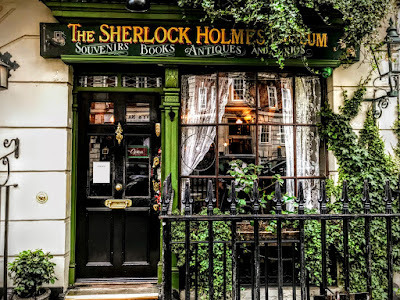 When the Sherlock Holmes Museum was established a few doors away, between No 237 and No 241, near the north end of Baker Street, close to Regent’s Park, it wanted to use the address 221B rather than No 239, and this became a protracted dispute between the museum and the Abbey National, a few doors away, whose premises were a few doors away at No 215-229. The museum went through several appeals for this mail to be delivered to it, on the grounds that it was the most appropriate organisation to respond to the mail, rather than a bank. All these efforts were in vain, and to reinforce its claims to the address and to mark the 150th anniversary of anniversary, Abbey National sponsored John Doubleday’s bronze statue of Sherlock Holmes outside the Baker Street station. In the past, Doubleday had produced a statue of Holmes for Meiringen in Switzerland, below the Reichenbach Falls where the intrepid sleuth fell to his apparent death in the story The Final Problem. The three-metre-high statue shows Holmes wearing an Inverness cape and a deerstalker and holding a pipe, attributes first bestowed on him by Sidney Paget, who illustrated Arthur Conan Doyle’s stories for The Strand Magazine. The Sherlock Holmes Statue Company Limited was set up to manage the project, and in 1998, and the Abbey National agreed to fund the statue because of its connection with Holmes. John Doubleday was given the commission 20 years ago on 31 March 1998. But the plans went ahead, and the statue was unveiled on 23 September 1999 by Lord Tugendhat, chairman of Abbey National and a former Vice-President of the European Commission. Abbey National was rebranded as Abbey in 2003, and it became a wholly-owned subsidiary of the Spanish Santander Group in 2004, with further rebrandings and renamings in 2005 and 2010. The debate over who could use the famous address was finally resolved when Santander left the former Abbey National headquarters in 2005 after more than 70 years. Today, Abbey House is a mainly empty office block that has been refurbished with office space and apartments that are ready for letting. 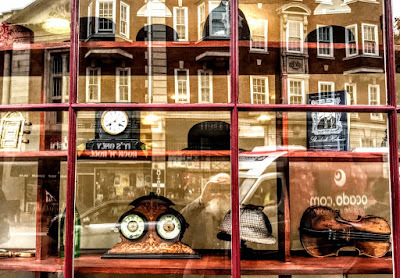 The City of Westminster gave the privately-run Sherlock Holmes Museum permission to use the number 221B for the Georgian town house that once had been No 239 Baker Street. All mail addressed to Sherlock Holmes at this address is now delivered to the museum, even though to this day Baker Street is the only street in London that has a house number that appears out of sequence with the rest of the street. 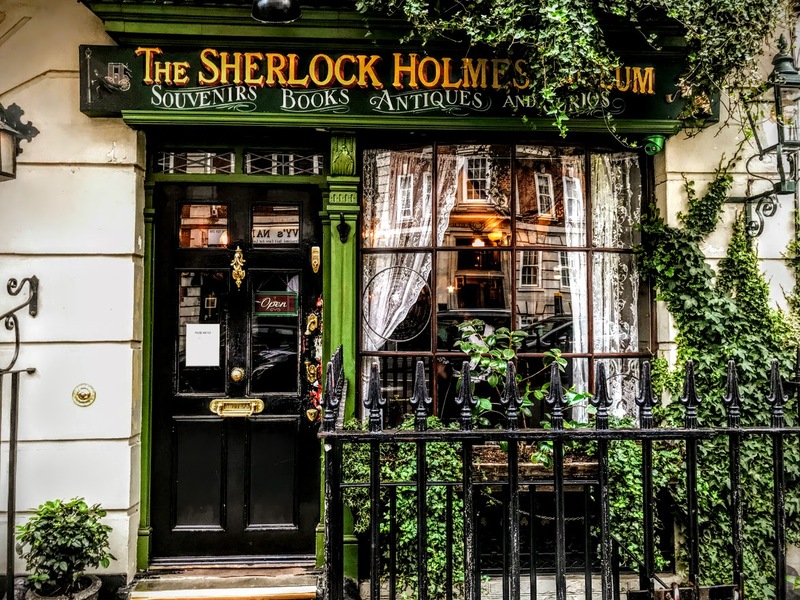 The museum is run by the Sherlock Holmes Society of England, a non-profit organisation, and has been visited by more than 2 million Sherlock Holmes fans since it opened in 1990. The Georgian townhouse on Baker Street was built in 1815, and had been a boarding house from 1860 to 1936, and covers the period of 1881 to 1904, when Doyle’s stories describe Holmes and Watson living in Baker Street as Mrs Hudson’s paying guests or tenants. The museum features exhibits from several adaptations of Sherlock Holmes, and recreations of scenes from the 1984 Granada Television series Sherlock Holmes. Inside, the museum has been designed to look exactly s it was described in Doyle’s stories. Sherlock Holmes’s housekeeper, Mrs Hudson, greets visitors and guides them through the Victorian rooms in the building arranged over four storeys. These rooms include Sherlock Holmes’s living room, study and bedroom, as well as rooms for Watson and Mrs Hudson, and a bathroom in a small loft. Visitors can climb up the 17 steps, similar to those in A Scandal in Bohemia, up to Holmes’s crowded parlour, filled with artefacts and furniture from the Victorian era, including traditional wallpaper and gaslight lamps. The rooms are packed with memorabilia referred to in the books, including a magnifying glass, an old copy of The Times, a pipe, a chemistry kit, ink bottles, a violin and a deerstalker. Arthur Conan Doyle’s daughter, Dame Jean Conan Doyle (1912-1997), also known as Lady Bromet, made clear her lack of enthusiasm for the museum. She feared the museum would reinforce the idea that Holmes was a real person, and she turned down an offer from the museum to create a room dedicated to her father. Since then, her father’s last remaining possessions have been sold off. But, as Holmes has endured, so have challenges over who owns the right to use his name and image, and who owns the copyright of Arthur Conan Doyle’s literary works. Lady Bromet and her brothers, Denis Conan Doyle (1909–1955) and Adrian Conan Doyle (1910–1970), the children of Arthur Conan Doyle and his second wife, Jean Elizabeth Leckie (1874–1940), inherited the copyrights with the estate when their mother died in 1940. When Adrian Conan Doyle died in 1970, Dame Jean became her father’s literary executor and the legal copyright holder to some of the rights to the Sherlock Holmes character, as well as her father’s other works. She once said that Sherlock Holmes was her family’s curse because of the legal battles over copyright. She and her brothers’ widows initially shared control of a literary trust, but they found it difficult to agree. Denis Conan Doyle had married a Georgian princess, Princess Nina Mdivani (1901-1987), and died in 1955. With a loan from the Royal Bank of Scotland in 1970, Princess Nina bought the estate and set up Baskervilles Investments Ltd in the Isle of Man. When Princess Nina defaulted on the loan, the RBS sold the rights to Sir Arthur Conan Doyle’s works to Lady Etelka Duncan. Her former son-in-law, Sheldon Reynolds, had adapted Sherlock Holmes in two series in the 1950s and the 1990s, and his ex-wife, Andrea Plunket, Lady Duncan’s daughter, administered the Sir Arthur Conan Doyle Literary Estate until 2014. But there has been a long-running legal dispute between the Sir Arthur Conan Doyle Literary Estate and Conan Doyle Estate Ltd, a privately-owned British company formed in 2005, and. For example, when Warner Brothers made Sherlock Holmes (2010), the studio was granted a license by the Arthur Conan Doyle Literary Estate but also ended up signing a ‘Covenant not to Sue’ with Conan Doyle Estate Ltd. There are eight or nine surviving Doyle heirs, but none is a direct descendant of the author as neither Jean nor her brothers had any children.